As of May 20 2013 I was technically homeless, jobless, and exploring the world on a 365 day adventure that took me around the world. This trip is something was something I was planning on doing since I caught the travel bug in 2011. While on the road I took on my very own Project 365 which I had on my to-do list for about 1,095 days. To make posting on to go easier and less time consuming I developed a second blog/website purely dedicated to my Project 365. It is a custom WordPress site that displays each photos Exif data, and has a mapping system that allows me to tag each photo on a global map so you can all see exactly where the photos were taken. 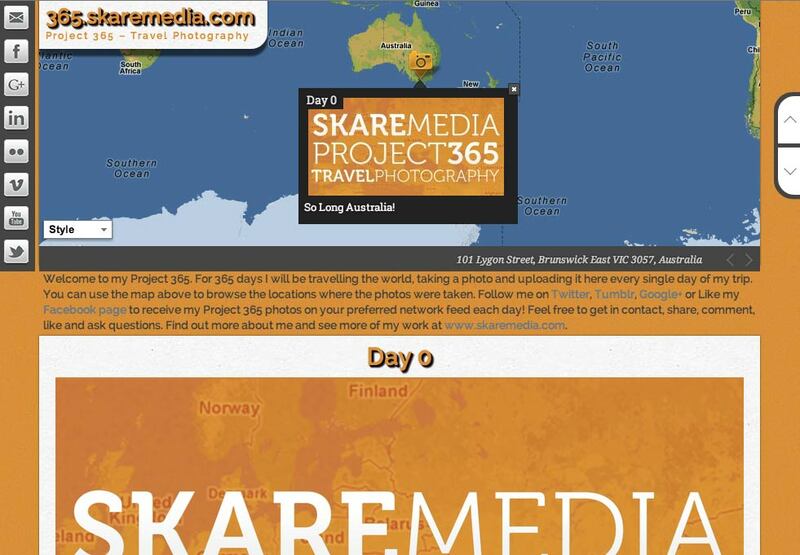 The project 365 site also automatically posted each photo/post to all the happening social networks. Facebook, Twitter, Google+, Pinterest, and even Tumblr for those more socially networked. This was litterally the best thing I have ever done. It changed my life, and I have the first year of my trip fully documented and my photography skills grew to a point that allowed me to sell some photos, win some competitions and even hold an exhibition.